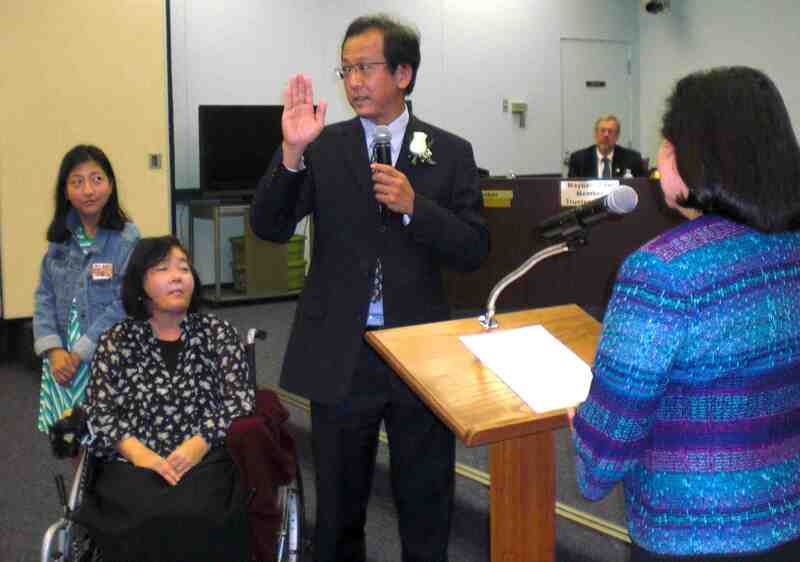 H. Ernie Nishii takes the oath of office from ABC Unified School District Superintendent Dr. Mary Sieu, accompanied by his wife, Young Choi, and daughter, Yuri. 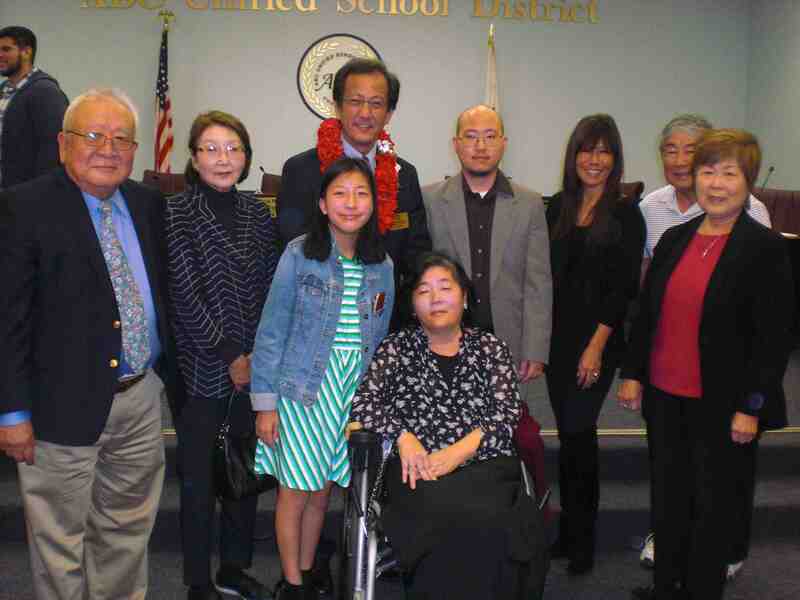 CERRITOS — Attorney Harunobu Ernie Nishii was one of three members of the ABC Unified School District Board sworn in on Tuesday night at the ABCUSD building in Cerritos. Composed of 10 preschools and 30 schools, the district serves more than 21,000 K-12 students in Artesia, Cerritos, Hawaiian Gardens, and portions of Lakewood, Long Beach and Norwalk along with 10,000 Adult School students. Nishii, who was sworn in by Superintendent Dr. Mary Sieu with his wife, Young Choi, and daughter, Yuri, at his side, was elected to represent Trustee Area 3 in November, defeating the incumbent, Lynda Johnson, former school board member Armin Reyes, and public affairs consulting firm CEO Daniel Fierro. Also sworn in were Soo Y. Yoo of Trustee Area 2, who was re-elected to a second term, and Olga Rios of Trustee Area 6. All three members were accompanied by their families. “I thank each of the candidates for the races that they ran. We told our residents what we stood for, but in reality we all stood for the same thing — we all stood for our kids. I respect Lynda Johnson for the years of service that she had to the board, for providing bridges to all aspects of our community. 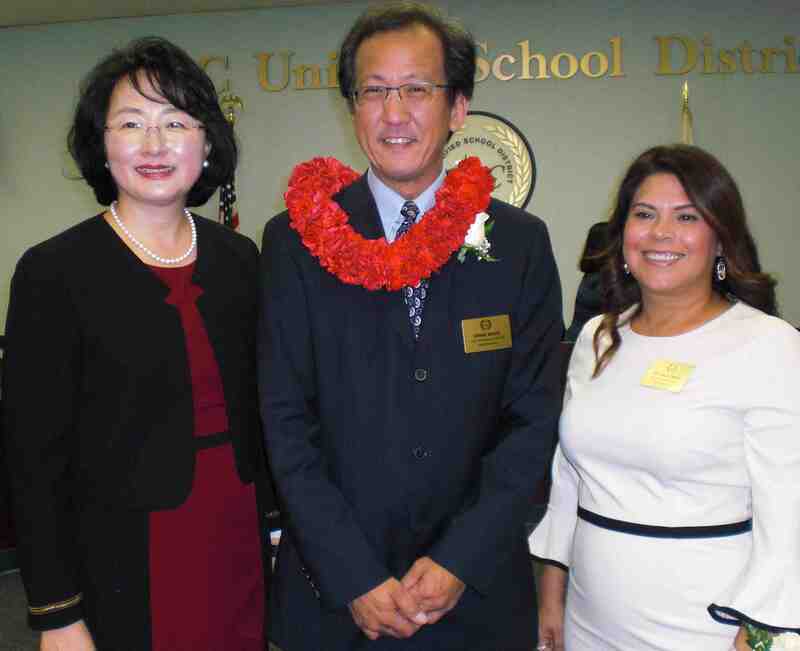 Soo Y. Yoo (left), H. Ernie Nishii and Olga Rios were sworn in as members of the ABC Unified School District Board. Nishii expressed gratitude to the voters and joked that he would walk the neighborhoods to thank each of them personally. He also acknowledged his supporters, including the Girls Scouts, Southeast Japanese School and Community Center, CEC (California Educational Centers), LEAP (Leal Elementary School Arts Program), block watch groups and farmer’s markets. Lastly, Nishii said he learned that the “overused” statement “It takes a village” turned out to be true. “My father-in-law and my mother-in-law graduated from Seoul National University and Ewha. Those are the Harvard and Yale of Korea. Those are the best schools. And they gave everything up to come to this country, start at the very bottom, and they helped build a family … they sacrificed. And when I decided to run, they’re back there sacrificing, making my daughter’s lunches, taking up all the slack … Without my in-laws, I could not have done any of this. They are truly my mom and dad now that my mom and dad are not here. H. Ernie Nishii (wearing lei) is pictured with his family. From left: Father-in-law Mun T. Choi; mother-in-law Boyul Choi; daughter Yuri; wife Young Choi; brother Matt; cousin Sharlene Miyagishima; uncle Kay Oda; aunt Nancy Oda. In addition to his in-laws, Nishii was joined by his brother Matthew; aunt and uncle, Nancy and Kay Oda; and cousin Sharlene Miyagishima. Christopher Apodaca (left), outgoing school board president, was congratulated by Cerritos City Councilmembers Frank Aurelio Yokoyama and Jim Edwards. During a meeting held immediately after the ceremony, the board officers were elected: Yoo as president, Leticia Mendoza of Trustee Area 1 as vice president, and Rios as clerk. The other members are Christopher Apodaca of Trustee Area 7 (immediate past president), Maynard Law of Trustee Area 4, and Sophia Tse of Trustee Area 5. 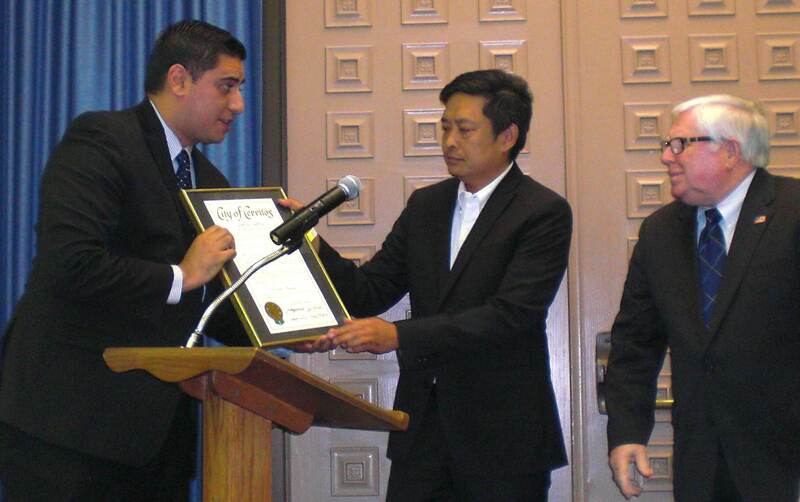 Several local elected officials, including Cerritos City Councilmember Frank Aurelio Yokoyama, and representatives of state legislators presented commendations to Apodaca for his tenure as board president. The Gahr High School Jazz Band opened the program. The ceremony was followed by a reception, after which the board meeting continued into the night.